This coming weekend, the San Francisco 49ers play the Jacksonville Jaguars in London, England. 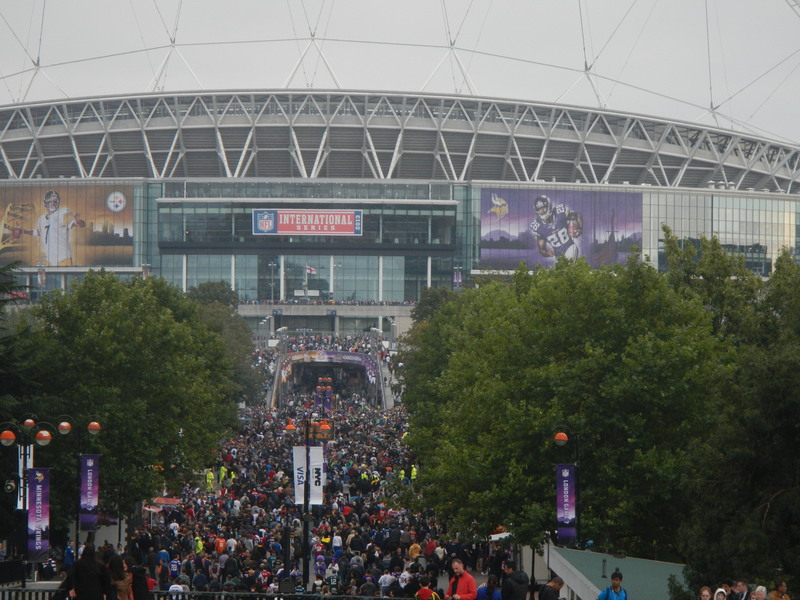 This is part of the NFL’s International Series, which is a football game played annually in London to expand the league’s reach globally. There’s even some speculation that the NFL will either move or add a franchise to the city. 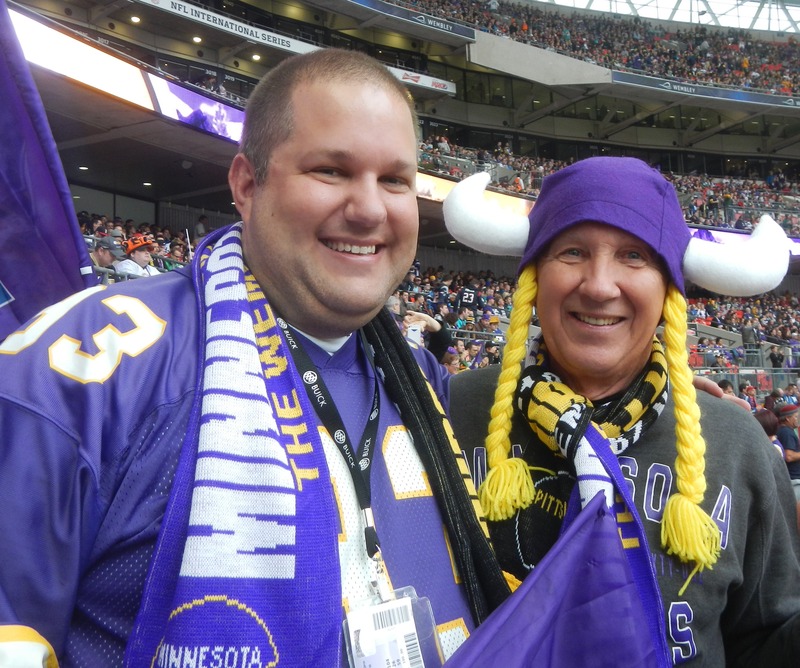 Many fans were talking about it when my dad and I were there a couple of weeks ago to see my Minnesota Vikings beat the Pittsburgh Steelers 34-27 in what will probably be their only win of the season. At least that’s how it seems after last night’s debacle against the New York Giants. 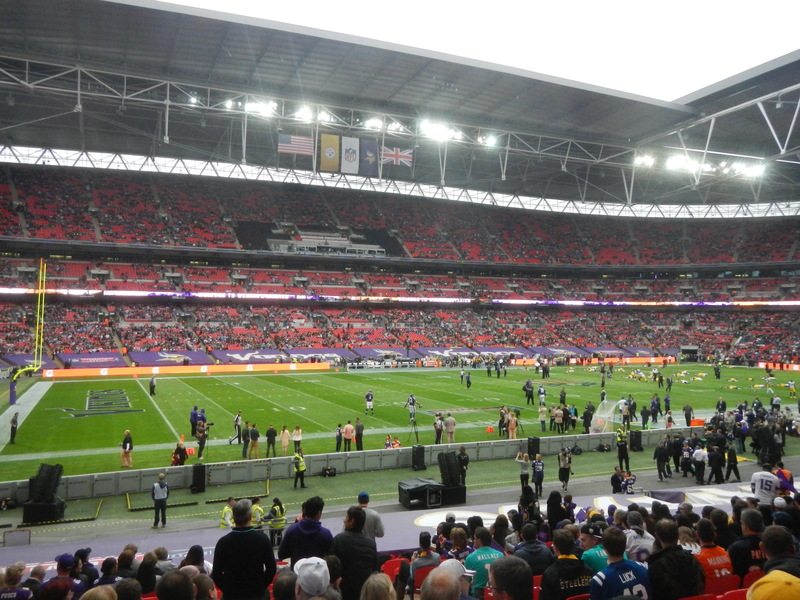 Last year, when I was home in Minnesota for Thanksgiving, my dad and I talked about going to London to see the game. The Vikings were on a roll at the end of the season, the playoffs seemed a possibility, and Adrian Peterson may even break the single-season NFL rushing record. So, why not go to London for next year’s game? It could be a blast, especially since we could be fielding one heck of a team at that point. We talked about it a little more after Thanksgiving, but, in truth, the trip seemed all but sorted at that point. We’d just need to book our air, hotel, and get some tickets for the game. I immediately began the search for our hotel and tickets, while dad watched for good airfares across the pond. Good news? I knew my way around London from a visit a year before, so I knew where’d we want to get a hotel. Bad news? As soon as I saw tickets for the game were on sale they were already sold out. Oh, no, no, no, no…this wasn’t going to happen. I’ll be damned if we weren’t going to the game. So, I started searching alternate broker sites with ticket packages. After looking on Wembley Stadium’s website (the game is hosted there each year since 2007) I found a link to Thomson Sport, which seemed to be a TicketMaster on steroids. Not only did they have tickets for the game, but they also had hotel packages. Even better, with the packages, we got a travel voucher card for the train for the day of the game and breakfast daily at the hotel. Fast forward several months from the booking of our ticket and hotel package, as well as airfare, and we were in London. Showing dad around town was great. It was one of the best trips I’ve ever taken. But the best of the best came with the game. A lot was riding on the outcome of it, too. 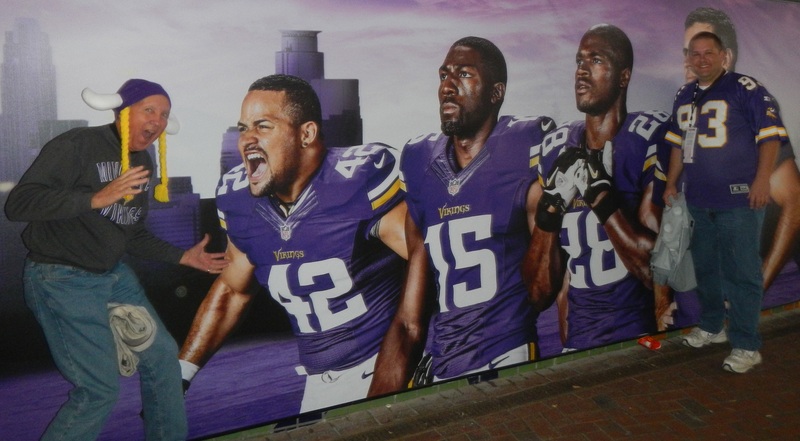 I mean, after all, if the Vikings lost, that could set a sour tone for the rest of our trip, which lasted another week. If they won, well, then we’d be some happy campers and all but guaranteed to have a great time. The Tube stations in London were packed with Minnesota and Pittsburgh fans. 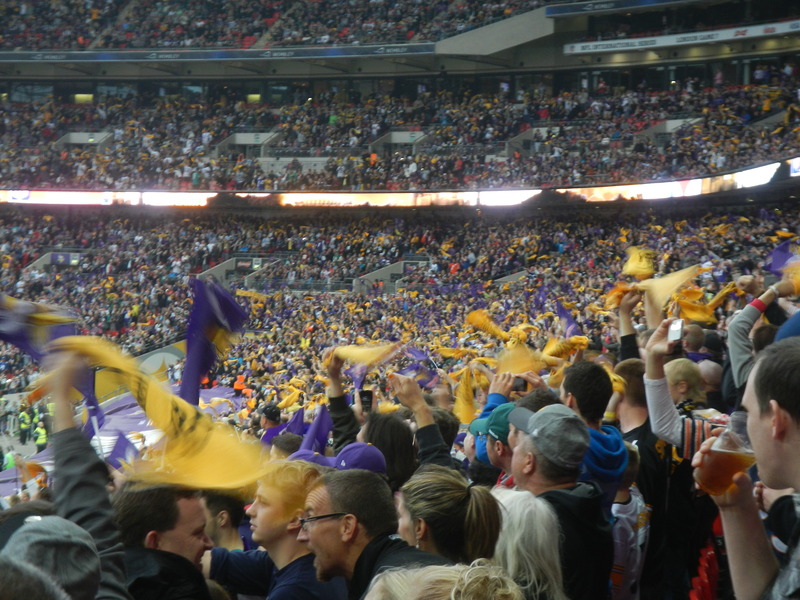 It was a virtual sea of black, purple, and gold heading to Wembley. Other colors – blue, white, red, green, and the like – dotted the mass; all fans who wore their team’s colors. 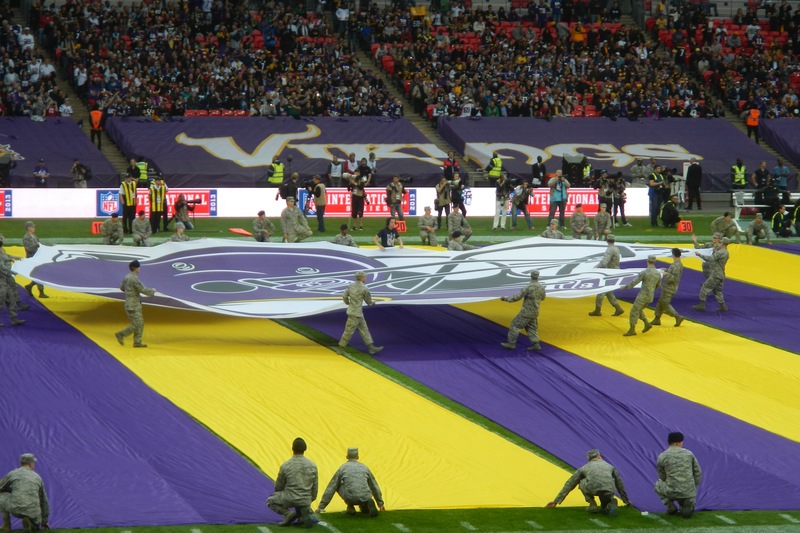 This made for a kaleidoscope of NFL jerseys that spilled out from the Wembley platform and flowed into the stadium. Dad and I stopped a couple of times to take it all in. After all, how many more times are we going to be in London to see our team play? Probably never, since they’re not on the league’s schedule to play over there anytime between now and 2016. Besides the game this weekend with the 49ers and Jaguars, Atlanta and Oakland are both schedule in different games along with Jacksonville three more times. Why so much of the Jags? Because they’re one of the teams who are speculated to be relocated overseas. No opponent for any of the three teams beyond this weekend has yet been determined. We walked directly to our seats – all of about ten rows up from the field – and to the stunning view of a half-empty stadium that would soon be filled with more than 80,000 fans cheering for who knows which team. It could go either way, really, with all of the fans supporting other teams, and we hadn’t seen a lot of Vikings fans our previous two days in town. And with all of the Pittsburgh fans we ran into, we assumed into would be more like an away game for the Vikings than a home one. 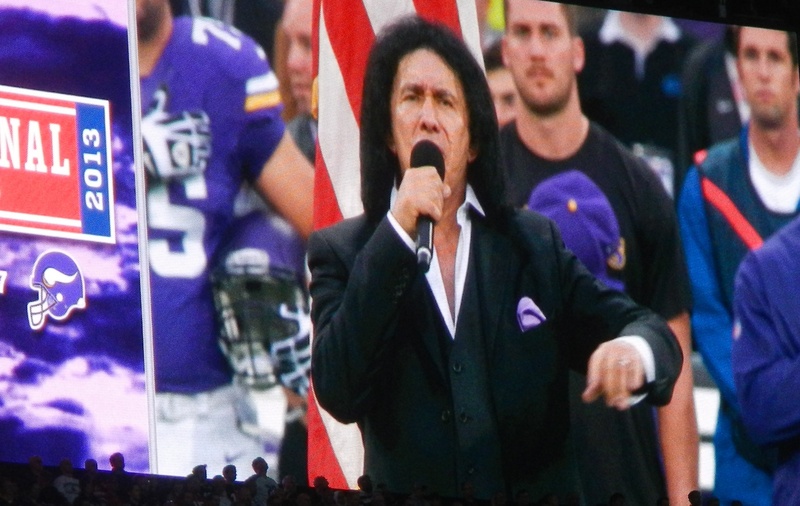 Gene Simmons from KISS singing the national anthem…and doing a great job. Shortly after Gene Simmons of KISS sang the American national anthem – which was just something altogether surreal, hearing it on British soil and all considering they’re the reason we have the song – and a short pregame celebration, the game was underway. The Vikings quickly took control of the game, and it almost seemed like it was going to be a route. Dad and I ready for kickoff! The Steelers came back and dominated the game after halftime. 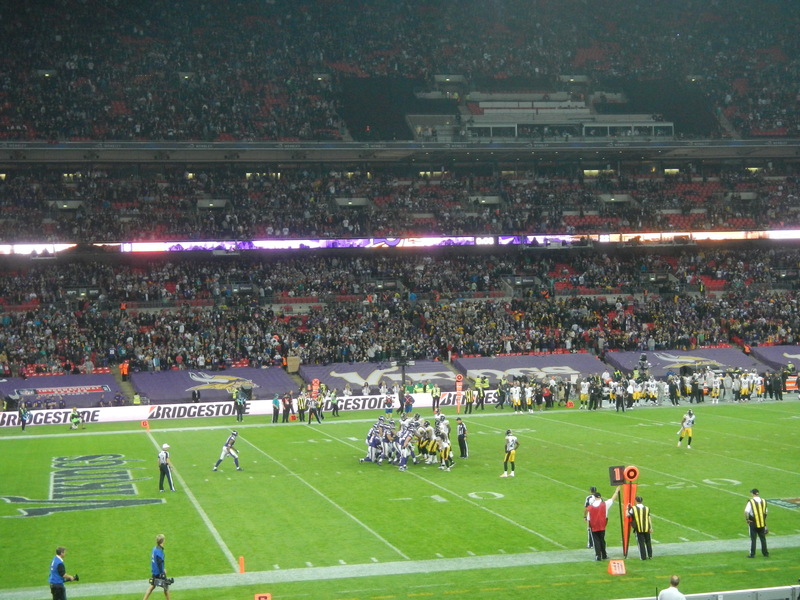 Despite the Vikings being up 17 points at one time, the Steelers were marching in the final second of the game. With only about ten yards to go to the end zone, all they needed to do was punch it in to tie the game and send it into overtime. Cheering after a Vikings touchdown! Thankfully, at least for my team, that didn’t happen. The Vikings recovered a fumble and kneeled down in the victory formation to take the game. Yay us! Too bad for you, Pittsburgh. Truly. Too bad for you. We saw so many saddened faces at breakfast the next morning that I honestly felt bad for their fans who had traveled all that way to see the team lose. Sure, some also came to see the sites and have a bit of a vacation, but others made the trip only for the weekend and the game. The Vikings in victory formation for the win! That night, while dad and I had a drink, I wanted to console the Steelers fans and tell them their team played a great game, but I kept my mouth shut. Even the next day and the day after that I felt it would be more like rubbing it in. And there was no point in that. So instead, I simply and proudly supported my various Minnesota colors – maroon and gold, as the case may be – for the University of Minnesota, since I was out of Vikings gear at this point.